The DataCal Caribbean language keyboard labels are a high-quality, durable and economical solution for creating an Caribbean bilingual keyboard. 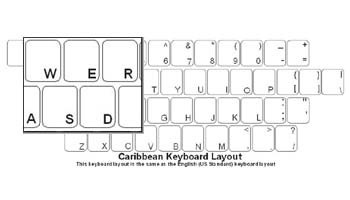 The Caribbean keyboard layout, it is supported in all English (US) versions of Windows. This label supports keyboard layouts for Afrikaans, Australia, Belize, Canada, Caribbean, Chinese Macau, Hausa (Nigeria), Igbo (Nigeria), Indonesian, Jamaica, Malaysia, Maori, New Zealand, Northern Sotho, Philippines, Sesotho sa Leboa (South Africa), Setswana (South Africa), Singapore, South Africa, Swahili, Trinidad, Tswana, United States, Uzbek (Latin), Xhosa (IsiXhosa), Yoruba (Nigeria), Zimbabwe, and Zulu (IsiZulu).